LG unveils the Optimus Pad LTE tablet | What Hi-Fi? 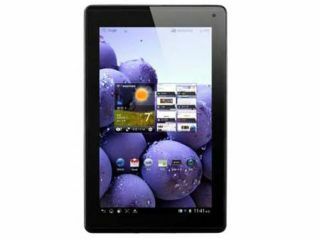 LG is taking another stab at the tablet market with the official unveiling of the 8.9in LG Optimus Pad LTE, reports our sister site Stuff.tv. In a bid to stand out from the mass of Android 3.2 Honeycomb clones, LG has packed its new tab with the True HD IPS 1280 x 768 display, which made its debut on the LG Optimus LTE smartphone. In addition to its eyeball-friendly display, the Optimus Pad LTE is also the first tablet to come with SD card support (up to 32GB). Not exactly a deal breaker for most, but it does mean faster read/write speeds than microSD-toting tablets. A 1.5GHz dual-core processor sits under the bonnet, complemented by a full HD video shooting 8MP camera with flash, a 2MP cam up front and 4G capabilities. The 9.3mm-thick tablet will keep you connected with HDMI and DLNA certification, with wi-fi and Bluetooth included in as standard. Initially it will be released in South Korea, with no word from LG on whether its shiny new tablet will be making its way into our neck of the woods. But as it's "initially" launching there, there's still a possibility it will eventually land in the UK.